I love Spinfest. 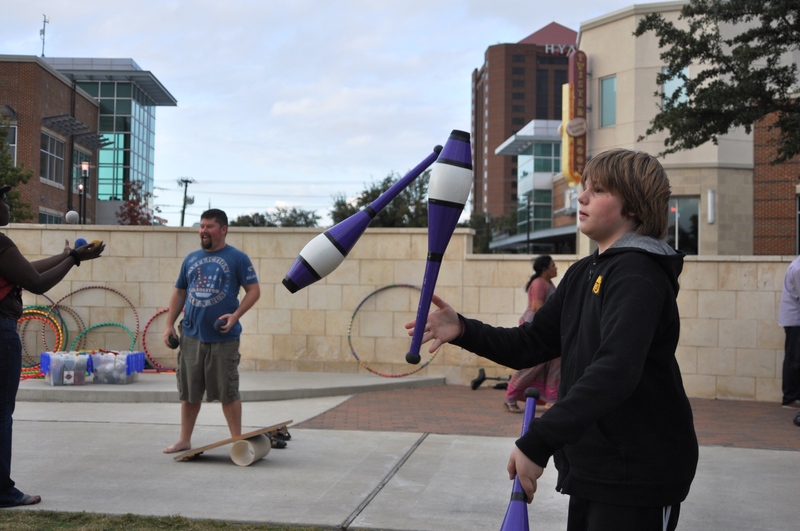 It’s a monthly get-together sponsored by the Circus Freaks at a shopping center and park at Central Expressway (Highway 75) and Campbell Road in Richardson. 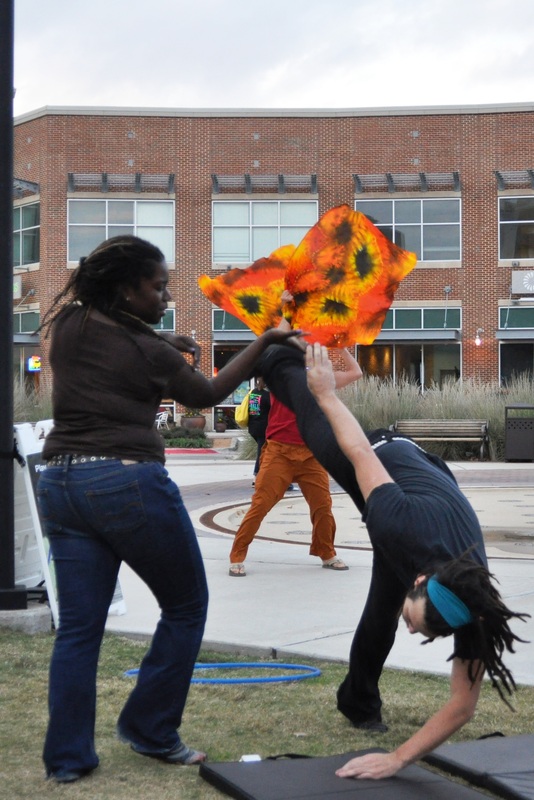 Like the Tuesday and Thursday night sessions at Valley View Mall in Dallas, Spinfest is a time when circus performers get together to practice, get feedback from their peers about what they’re doing, and help each other. At Valley View, it’s more practice than performance — but people come to Spinfest ready to perform. I don’t get to go very often, because the Tuesday and Thursday night sessions are from 8 until 10 p.m., and I usually have circus classes until around 7:30, and then I still have homework to do. And a lot of times, I work on Saturdays. But I got to go this month, and it was a lot of fun…for the first hour or so. Then I tried a trick I haven’t really mastered yet, and I fell off my rola-bola. It’s the first time I’ve fallen in a couple of years, and I really twisted my ankle. I think it caught underneath the board, but I’m not really sure. I was trying not to let my head hit the concrete. So now I have missed circus class again on Tuesday — after missing it twice last week because of other stuff — and I had to sit out in PE, too. I’m wearing an ankle brace, but my foot is starting to feel better. The good news is that I got to sit and watch everybody else at Spinfest, while my grandparents put ice on my ankle. I love to perform, but sometimes it’s fun to be in the audience, too! There were some people who just happened by — they’d never tried to juggle or use a hula hoop before — and they got really into it. That was a lot of fun to watch. The next time I will get to go to Spinfest will be in January, and I will be ready to do that trick on the rola-bola for sure. I love Spinfest! 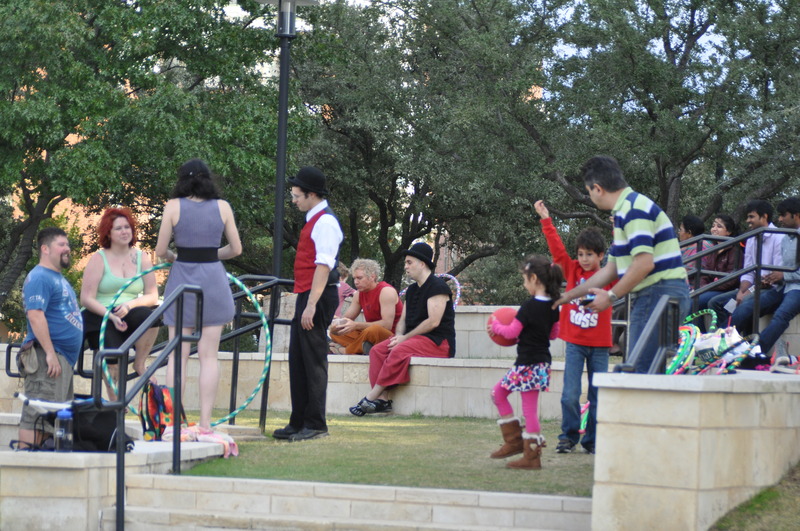 It’s a great place to watch circus performers — or learn a new trick. Kids have a great time, but I like it when adults try new things, too. Spinfest was a lot of fun, and the clowns were having a blast. It was kind of windy — I don’t know how that guy kept his silks in the air! I was juggling clubs and balls, and having a good time at Spinfest last Saturday. This is me just before I fell and sprained my ankle. It looks pretty easy, right? 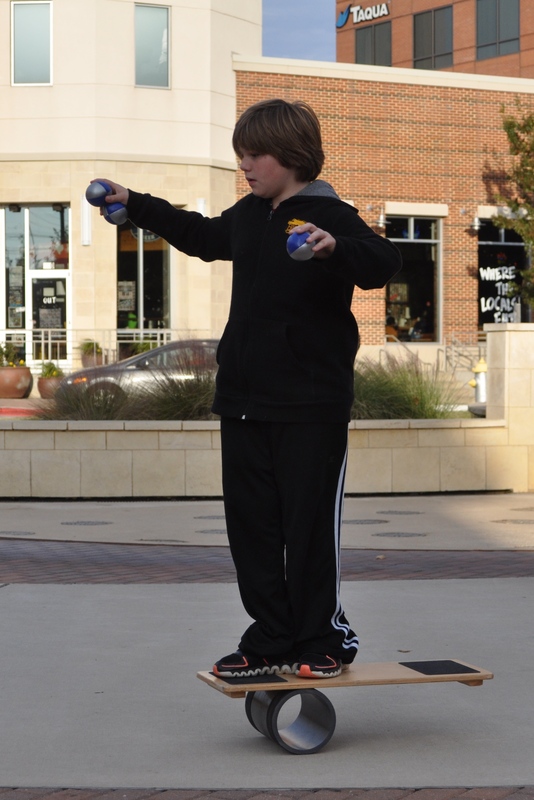 Just balance on the very edge of the board, and start juggling. It wasn’t so easy for me last Saturday!